Three full-length plays opening in three major cities in three months! GEEKS! THE MUSICAL opens Off Broadway April 21sth! Tickets here! FIGMENTS, winner of the 2019 Las Vegas Little Theater New Works Award, will be produced May 3-12! Tickets here! MASTERS OF THE DARK REALM opens June 21st at the Actors Workout Studio in North Hollywood, CA. Produced by Force of Nature Productions. More information here! CYBER-O was one of five finalists (out of 310 plays!) for the Free Spirit Theatre's Spring Play Contest in the UK. My darkly comedic radio series, MARY WORTHLESS, continues weekly on The Old Tyme Radio Hour, broadcast on WAMF 90.3 in New Orleans Thursday nights 9-10pm (Central Time). Listen to past episodes here. So far this year, two of my plays have been turned into short film. NO PROBLEM by Force of Nature production. And ARE YOU GOING TO EAT THAT? by The Northern Virginia Motion Picture Co-Op. Upcoming short plays: DON'T YOU FORGET ABOUT ME at Whitefire Theatre's Company Shorts. Tickets here! I was interviewed by First Comics News! Watch it here! CLASS REUNION received a great review from BroadwayWorld: CLASS REUNION is "a game-changer in the way we think about school shootings and Misuraca hits his theatrical target tacitly but with great potency." Read the entire review here. CHRISTMAS MORNING's review in Broadway World. A sweet about one of the actors in the Houston production of my play JOEY & CHUCK. Galaxies Apart in Forth Magazine. Disaster read on and discussed on The Pretty Trees Podcast. Blind, Deaf, Dumb in FalsoMutis. 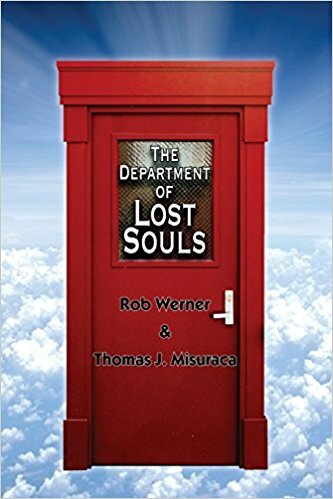 From the deranged minds of Rob Werner and Tom Misuraca comes a novel 20 years in the making: THE DEPARTMENT OF LOST SOULS! A tale so mind-boggling that Tom and Rob had to write alternate chapters of it without knowing what the other would write next, lest they go mad from writing it all down at once! And now you get to read it! If you read one book about hit men, beat poets, gay circus clowns, and a giant cannoli on wheels this year–read this one! WARNING: Contains strong language, adult-ish situations, and characters with unfortunate body odors. Buy it now! After sitting and collecting dust for decades, I've decided to self-publish a collection of my first published short stories. 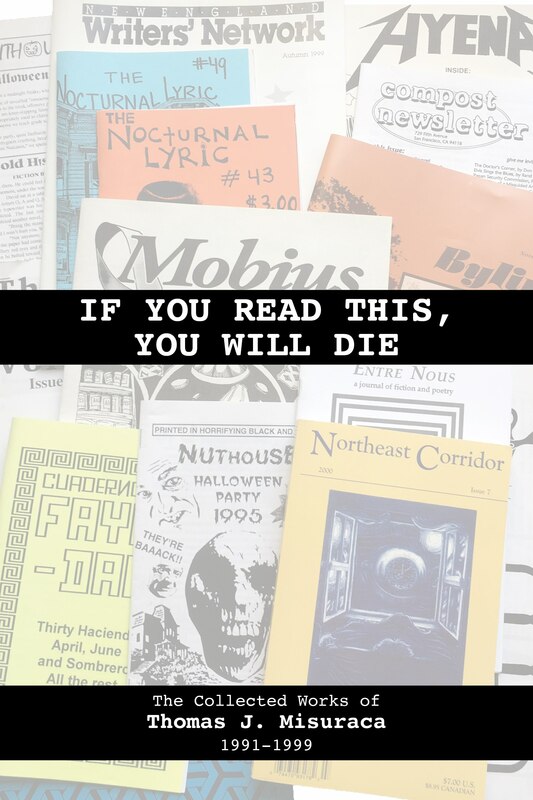 IF YOU READ THIS, YOU WILL DIE rounds up 13 short stories and one poem. Meet animated gelatin molds and inflatable dolls, professional mourners, imaginary friends, cult leaders and the lovely Golden Curls. Fear menacing boxes, the sun, the clock striking, faces and fear itself. Learn how to sell your emotions, live in a graveyard and deal with unruly written words! Be the first on your block to own a piece of my past! Buy it now! Tom Misuraca was born and raised in Boston, where he received a degree in Writing, Publishing and Literature from Emerson College. His first story, If You Look At It, You May Die, appeared in Emerson's Hyena Magazine. Since then, his short stories have appeared in over eighty publications worldwide. In 2009, Tom’s vampire parody novel, Lifestyles of the Damned, was published by James A. Rock & Company. Tom was a late bloomer in the theater world, but his writing fit it perfectly. Over fifty of his one-act plays have been produced in almost every major city in the United States as well the UK. He has won multiple audience favorite awards. Within the span of a year, four of Tom’s full-lengths were produced in Southern California: Geeks! The Musical, The ParaAbnormals, Edgar and Tenants. All played to sold out crowds and great reviews. Geeks! went on to be produced Off-Off Broadway in October 2013 and in San Diego in the summer of 2014. In 2014, he won two playwriting awards: The Pickering Award for his old-age superhero play, Golden Age, which was produced at the Tibbits Opera House in Michigan; and the Las Vegas Little Theatre New Works award for Little Black Book, which was produced in Las Vegas in April. Within one month, four of his new full-length plays were seleceted for staged readings by four different theater companies in Los Angeles. In 2015, Golden Age was produced in McKinney Texas and The eBook of Love was produced at The Las Vegas Little Theatre. He had the most short plays produced and stage read than any previous year, including Manservant 3000 being produced in Seoul and Daejeon, Korea. 2016 kicked off with two of his short plays being produced by the Whitefire Theatre, who twice annually feature his work in their Shorts festivals. In April, his ten-minute play, Falling Bodies, won the first O'Shadow Fest. And his full-length, all-female, horror/comedy, Demonic Housewives, produced by Force of Nature Productions, sold out over half its run at The Archway Theatre in North Hollywood. He was also accepted into the New Works Studio and Scripps Ranch Theatre in San Diego. He spent nine months developing a new play, Cyber-O. It was stage read there in September and the revisions will be stage read at the Asylum Theatre in Las Vegas in November. In 2017, his one-act play, Cocktail Party, was runner-up audience favorite at The College at Brockport's Festival of Ten X. Five of his short plays were produced at Whitefire Theatere's Spring Shorts, one of four Los Angeles theater companies showcasing his work wihtin one month. And in Chicago, many of his funny short radio plays are being produced on Small Fish Radio's weekly podcast. He is a member of the Dramatist Guild, the Los Angeles Alliance of Playwrights and FirstStage LA where he served as President of the Board for four years. When he’s not writing, he works as a freelance graphic designer. He enjoys yoga, dancing, music and reading.